Please invite undocumented clients of prevention & care services to attend. 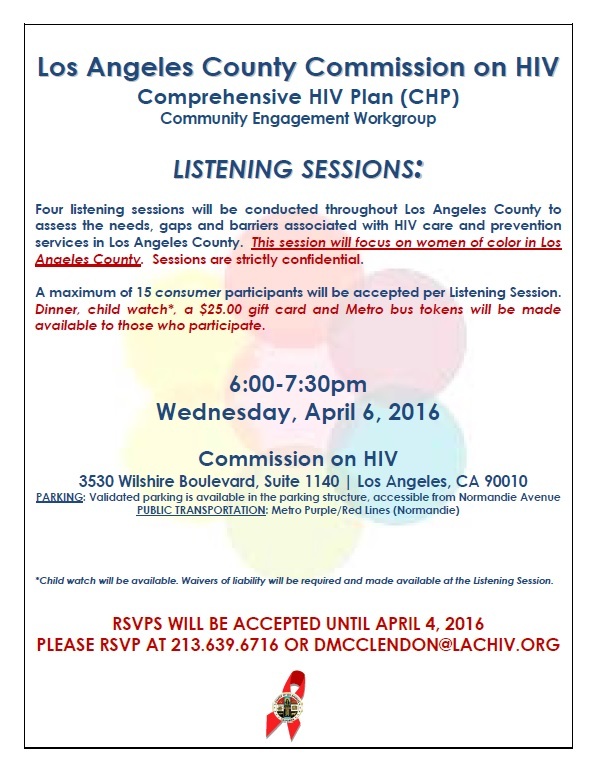 As you may know, the Commission on HIV has planned four listening sessions throughout Los Angeles County to target specific communities to assist the development of our federally-mandated Comprehensive HIV Plan (CHP)*. The first of the four sessions will be focused on the undocumented community. We are respectfully requesting your assistance in recruiting consumer (HIV+ and high risk HIV-) undocumented participants. As reflected in the attached event flyer, the session is scheduled for Monday, April 4, 2016 at 6-7:30pm. It will be held Plaza de la Raza’s music room in Lincoln Park. Bus tokens, a $25 gift card, dinner and child watch** will be available to those who participate. The session will be conducted in Spanish and is strictly confidential. Please note the RSVP deadline is March 31, 2016. However, to ensure a safe and effective process, we will cap the number of participants at 15. The 28th Annual Nat’l Conference on Social Work & HIV/AIDS wants to integrate social media into their events. Do you have ideas?